June 2014 – RallyNews – Patterson Pacenotes Extra's….. The Scottish Rally kicks off this evening with a ceremonial start in Dumfries and is quickly followed with the spectator stage at Heathall on the outskirts of the town. The BRC, Challenge and Historic all start tonight while the SRC crews set off in the morning but do the stages in a different configuration. 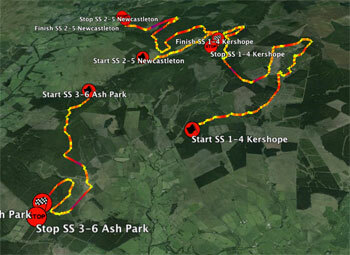 Good luck to everyone invloved in the Rally and enjoy the Google Earth stage traces. 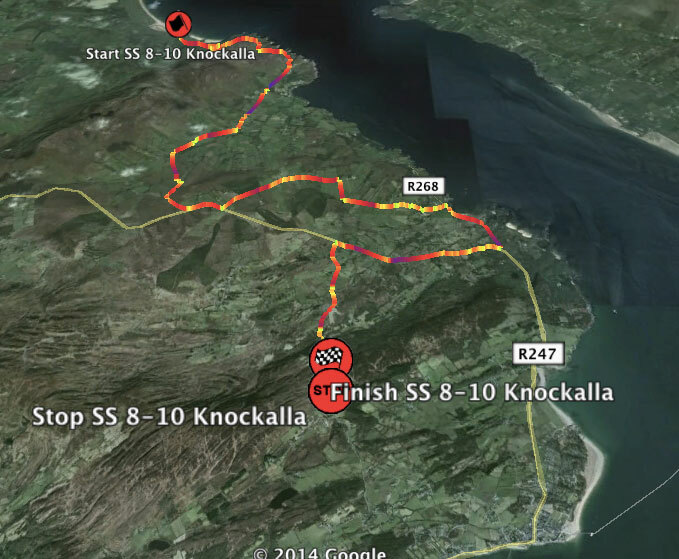 The final leg of the Donegal International is almost here. This could prove to be a real sting in the tail. Three classic tests. High Glen, Atlantic Drive and Fanad Head all done twice. The big change for 2014 is that Atlantic Drive is being run in a clockwise direction. The first time since 2008 we think. Other than that it is a race to the finish. Overnight Declan Boyle leads Sam Moffatt by just a few seconds while Daniel McKenna is well in command of the National Rally. Good luck to everybody on the final day and stay safe. Enjoy the download. While we are pre-occupied with the Donegal Rally where we are providing our RallyNews service, we cant ignore the next round of the RAC Historic championship. The Carlisle Stages joined the calendar last year as a fledgling event for the new championship. Now in it’s second year of running, the rally has attracted a strong and interesting line up of cars and crews. The stages are all in the Newcastleton/Kershope forests and when we made the Patterson Pacenotes last week, they were in great shape. So good luck to all involved on Saturday’s rally and most importantly , enjoy the day and the Google Earth files listed below. Remember though. Please note that the Google Earth files are contained in a zip file. If you are using a computer, they will be downloaded to your downloads folder and can then be opened with google Earth. For mobile/iPhone/iPad users – you will be asked to “open in” an app like iFiles or Evernote etc. You must do this and then unzip the files. After this the files can be opened in Google Earth. It seems a long way around but it is worth it. It is assumed that you have installed both a file viewer & Google Earth beforehand. If not they are all available via the App Store and the Android Play Store. The Donegal Rally is on us once again. Over the next three days of the rally, we will post each days Google Earth Jemba Traces for your enjoyment. Day 2 is located to the north of the HQ at Letterkenny with service based at Millford. The Saturday stages are more traditional in their nature. In the morning the rally tackles two very familiar stages. Garrygort is an old classic but is still very tricky in places and then it is off to Knockalla for the sweeping coastal stage. Very fast to start with on the coast road, it then moves inland for more technical roads. The Carnhill stage is virtually a new stage, a new combination of roads, very demanding, with narrow twisty tracks but also some very fast open roads. Gartan is still a relatively young stage and enjoys some very fast flowing roads over crests and jumps mixed in with more narrow but still fast tracks. Enjoy. The Donegal Rally is on us once again. 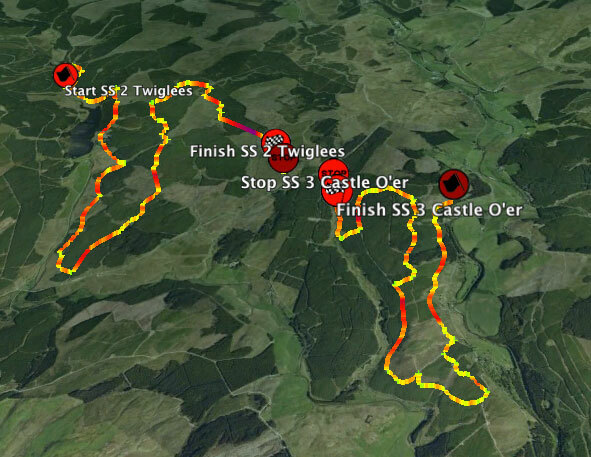 Over the next three days of the rally, we will post each days Google Earth Jemba Traces for your enjoyment. Day 1 is located to the south Letterkenny and the stages are generally very fast moorland type roads moving down into the valleys and back up onto the moors again. Enjoy. Following the recce day’s in Letterkenny for the Donegal Rally last weekend, we headed for Waterford and the sunny southeast at the start of the week. The Ravens Rock Rally has it’s foot firmly in the history books of rallying’s past and despite being a drop out round this year’s Dunlop National Championship, it once again looks like a little classic. The Rally, organised by the Carrick on Suir Motorclub has always taken advantage of its geographical location and moved around accordingly. This year is no exception. The main bulk of the stages are now south on Waterford City, conveniently placed on the headland between the seaside resorts of Tramore and Dunmore East. Waterford Airport plays host the service park and is quite literally a stones throw away from the Sunday Stages. The rally will kick off with a ceremonial start on Saturday evening followed by a short but proper closed road spectator stage just to the South West if the city. The main viewing point is close to the start at the first junction with plenty of safe spectating. Without giving too much away, the Sunday loop has plenty to offer. A mixture of very fast flowing roads with narrower more technical roads thrown in to link up the stages. Our stage telemetry is shown below and gives a good indication to the speeds the crews will be traveling at. This is a further dimension to the Patterson Pacenotes and it gives a small insight into the technical depth we strive to, to get the notes as good as possible. The Notes & DVD will be ready on Thursday 19th for despatch.